Sorry about the confusion DS, I got mixed up between who said what in the quotes, now I see why you were asking me why I mentioned your forecast CET. Anyway, whatever the provisional value for today, when they adjust it to calendar day as I think they do, it will likely go up a bit, so will need to check that record value of 12.2. Sunny Sheffield at 7.4C +0.3C above normal. Rainfall 82.3mm 103.7% of average. I'm wondering if there's a chance of 100mm being reach now. The final temp looks to be 7.4C unless tomorrow is a lot milder or a lot colder than forecast. Hadley EWP tracker was at 87 mm through 27th, then add on whatever they make of last 48 hours and a top up on 30th, could go to 105 mm now, possibly 110. Rainfall quite heavy in west last 36 hours. EW average probably about 15-20 mm. Singularity will end on a high note easily winning the contest either way we scored it. So you didn't make a forecast then! Anyway, I went for above average(7.3) with a cold last third bringing the CET down, which is what has happened, final figure could be 7.9, so not a bad forecast. A bit late but I'll go for a CET estimate of 8.4C a very mild month with a brief cold snap in the second half. Sunny Sheffield is at and will finish on 7.4C +0.7C above normal. Unless the mild air arrives much quicker than shown. Rainfall won't make 100mm but should finish in the 90's. At the moment it's at 86.6mm 109.1% of the months average. An rare upward correction this time, of 0.03C. Roger J Smith, syed2878, vizzy2004 and Quciksilver1989 were each 0.1c out. A large mix around with a mostly new Top 3 . 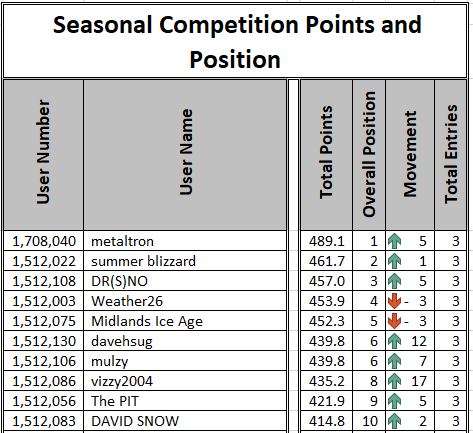 Melatron was 1st, Summer blizzard 2nd and DR(S)NO 3rd. Overall no changes in the Top 4. 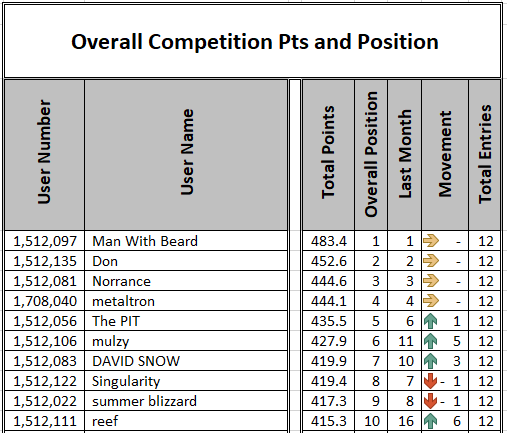 Man with Beard with an emphatic win, Don 2nd, Norrance 3rd, metaltron 4th. Well done and Congratulations to all the winners and Thanks to everyone taking part. Happy with my result this month! November finished 7.6c here, 1.1c above the 1981-2010 average. Rainfall finished at 54.8mm which is 84% of the average. So for the contest year, our consensus was about 0.2 deg better than the two normals, and our consensus ranked about seven spots higher in the raw ranking (based only on temperature error). A mean error 0.88 deg (our consensus mean error) was surpassed by 12 of the regular entrants and matched by two others. A mean error of 1.06 or 1.07 deg (the two normals) was surpassed by about 27 regular forecasters in these contests. This tells us that the top half of the field are showing some skill vs random chance. This past year, the more recent normals did no better really than the 1981-2010 normals, likely a result of the cold months in spring and autumn. That mean error of 0.88 deg is an average absolute error, the mean error itself was -0.27 deg. This means that our average forecast was 0.27 lower than the actual outcome, over twelve months. We guessed generally lower than the warm months and generally higher than the cold months (relative to normal) which shows a conservative frame of mind among the forecasters, however, we spotted trends to beat normals. The mean of the twelve months was 0.48 deg above the 1981-2010 normals. We cut 0.21 off that with our slightly skilled group consensus. By rank of consensus, the order of skill shown was October first and March tied second with June. I think our biggest challenge is to spot mid-month reversals of trends. For example, August which reversed trend around the 23rd finished a good deal cooler than most of us expected and this was our worst outing relative to the two normals, September was only marginally better. On a different topic, congratulations to Man With Beard for leading the pack (again). And well done to all in the top ten of the annual contest. Finally, thanks to J10 for putting up with all of us. As to the November win, I seem to remember this happening in 2015 which is not a great thought, is it? At 8.3c November 2018 is the first ever November going back to 1659 to record this exact figure. However October's 1829, 1799, 1763, 1751 and 1704 did record this same figure. March's 2012, 1990 and 1948 did also, as well as April's 1985, 1975, 1930, 1900, 1828, 1822, 1805, 1801, 1773, 1728, 1704 (same as October the same year) and 1703. This covers every recorded instance I believe. Funny though that November ended up with a CET much more common in April than any other month. Yup. Without doubt, that's the only conceivable explanation. I wonder why they have done this? oh and @Summer Sun and @BornFromTheVoid, thanks greatly for all your updates every month, wouldn't have been the same without you both. I'm certain they have a perfectly valid explanation for the correction applied, the same as every month. People shouldn't read it as an upward adjustment, it was more or less sideways, so that means they didn't find many cases where the calendar day readings were much different from the partial calendar day preliminary readings. If you have a month with several days of clear, cold evenings that see midnight lows, then you're going to get a big downward adjustment. The one or two cold spells of the month were cloudy and probably didn't behave in that way. The very mild 29th was left with a similar final value to provisional. So were the other mild spells. I was expecting a small downward correction too, just because the average of them seems to be 0.2 to 0.3. So it was unusual. Now we have a November at 8.3, and it will be the 21st warmest on record (1659 to 2018, 360 years of data). It was the 13th warmest of the past hundred or also since 1937. It will be the ninth warmest since 1977. And it will be the sixth warmest of the 21st century so far. The shorter the interval for comparison, the more ordinary it appears. It was warmer than 94% of the past 360, 85% of the past 80, 80% of the past 40, and 67% of the past 18. In fact, in the ten Novembers from 2009 to 2018, it was barely above average, and fifth warmest (the average of these ten being 7.5). The thing about the 'adjustment' is that the final figure is taken from a different set of stations than the running figure. Generally the set of stations used for the final figure produce a cooler CET than the running CET- in many ways the running figure is a very close estimate. Nothing to do with urban warming. I know this because I emailed the Met Office about it a few years ago. Interesting to get the rise after David Snow being so brazen and confident that there was going to be drop again. 8.3C is a lot warmer than many were predicting mid-month. Thanks, I was sure that someone had done this at some point and shared it on here - now I know I wasn't going insane! But David Snow is correct that they subtract 0.2C off after all other adjustments due to urban warming (which presumably is why all corrections seem to be centred around -0.2C, more or less). The Hadley EWP tracker chart has reached its conclusion, 103 mm is the estimate for November. We'll get some official numbers in a day or two and reveal the scoring, but I am sure that Singularity will be our first contest year (for EWP) champion in both the scoring alternatives used. I would love to be able to reveal the final results of the EWP contest (using NCIC this past contest year, we'll change back to Hadley only for 2018-19) but neither NCIC nor Hadley have updated tables yet. The Hadley tracker was showing 103 mm as a final value. If I go with 103.9 (NCIC is usually a bit higher than Hadley, it seems) then I have a final table including annual scoring. So assuming only small changes required in the November scoring, I can post it as soon as I know the outcome. It's easy to confirm however that Singularity has won the contest as there are no outcomes, even preposterous ones, that alter the scores enough to bring anyone up the table to within range. I think I know who finished second but we'll keep that a secret until we know for sure, however, our consensus moved up the table to second place as well, and the two normals made upward progress to finish 10th (1981-2010) and 12th (1988-2017). 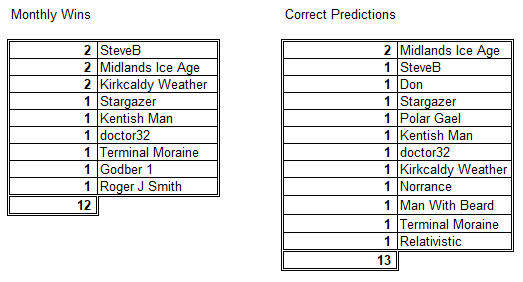 That won't bump any forecaster ranks down, there are 10th and 12th place human participants too. Also the Hadley numbers will likely give the same general order of finish. It may be that I'll have both of these alternate scoring tables ready within minutes of each other and we can tie a ribbon around this contest. Sorry about the delay but it's out of my hands.